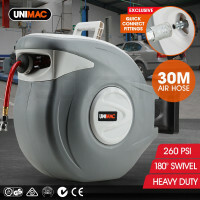 The Unimac ACM-500 Direct Drive Air Compressor has landed and is a trade quality unit ideal for anyone looking for the assurance that only a powerful, reliable model can provide. 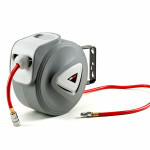 Powered by a robust 3.5HP motor that’s capable of delivering 212 litres per minute from its large 50 litre air tank, the ACM-500 ensures continuous air supply for a huge variety of applications. 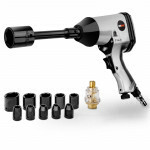 With two outlets (¼” & Nitto couplers) it will attach to wide range of pneumatic tools including grinders, ratchet wrenches, nail guns and saws. Its fitted pressure control and two large dual gauges allow you to easily keep tabs control how much pressure it outputs at any given time. The ACM-500 has a ‘go anywhere’ design with its extended handle and all-terrain wheels and sits stably on a large anti-vibration foot. It’s safe to say, the ACM-500 blows the competition away! Download the manual for ACMOILUMCA500 for detailed instructions on using your product. 16 Ga. brad nails and staples, and finish nails in 18/16 Ga.